Concealing ground blinds with natural vegetation is hardly a new concept, and just about all of Ameristep’s ground blinds have varying numbers of sewn-in brush loops to facilitate this process. But wouldn’t it be nice if an entire blind was engineered and built for this purpose? Ameristep’s engineers thought so, too, and created the Shifter Blind. The highly-customizable Shifter features two rows of sewn-in perimeter brush loops, additional sewn-in loops on the roof and corners, and eight sections of shock-cord that can be connected to hubs or stake loops to help hold heaps of branches, brush, sticks, stalks, grasses and greenery. While the new Ameristep Shifter offers unprecedented concealment options, this breakthrough blind’s large window array is just as compelling and attractive – an important feature that affords maximum versatility when one considers the amount of supplemental camouflage that may be stacked up outside. The Shifter provides full-coverage mesh windows on two sides, complete with built-in gun ports designed for firearms or crossbow hunters. These large windows also feature Ameristep’s Dual Window Curtain System, a split magnetic curtain & toggle window design, allowing the tops or bottoms of each window curtain to be opened or closed quickly and quietly for optimal viewing and concealment. 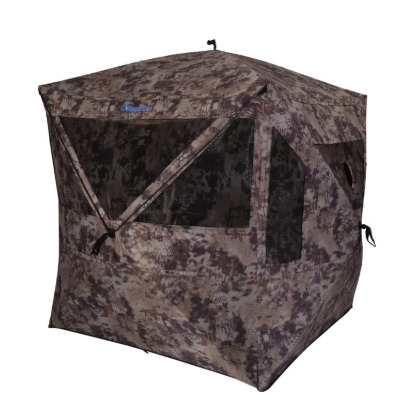 The other two sides have large corner windows with shoot-through mesh, tailor-made for bow hunters. The Shifter Blind comes in effective Kryptek Highlander camouflage pattern, impeccably printed on Ameristep’s iron-tough yet soft and quiet Durashell Plus fabric – a dull, lightweight woven polyester that won’t reflect light. Inside, hunters disappear against a stealthy, black ShadowGuard coating. A super-stout frame is required to support the added weight of all that supplemental camouflage, and the Spider Hub System stamped steel design is up to the task.